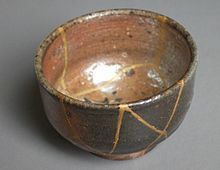 Kintsugi as the Japanese call it or “golden joinery”. It is believed to have started in the 15th century. It’s basically highlighting breaks or damage obtained through time with gold. A shogun sent a broken ceramic bowl out to be fixed and was horrified when it returned with ugly metal staples where the break was. His name was Ashikaga Yoshimasa and he set out to find a better way. So began the journey to find a way to repair pottery and make a broken piece as good as new. By filling in the breaks with gold they turned a broken piece into a work of art and highlighted it’s history at the same time. 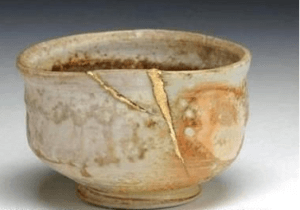 The technique incorporates gold, silver and even platinum into the repair. The idea of illuminating the damage is an interesting philosophy. I wonder what a homeowner would say to filling in cracks in their wall with some gold?